The Patrician Secondary School began on 26th August, 1958 with 27 students, using the present Primary School premises beside the Parish Church. On the 8th September, 1960 Mgr. Miller opened and blessed the Secondary School at Charlotte Street and 48 pupils attended. Brother Silverius, Principal, Brother Maurice, Mr Michael MacDermott and Mr PJ Kennedy were the first teachers in the school. During the 1960’s this school flourished and expanded until it was no longer able to accommodate the number of boys seeking admission. In 1969 the site of our present school was purchased and the following year the new Patrician Secondary School was opened with Brother Joseph Doheny as Principal. Since then, the school has been extended on numerous of occasions. Staff and pupil members have continued to grow and Brother James O’Rourke, as Principal, oversaw and engineered many changes in the Patrician Secondary School – i.e. curricular and extra-curricular opportunities. The first lay Principal Mr Seamus Mullooly was appointed in 1994. His successor, Mr Peter O’Reilly assumed the Principal role in 2004. Recent changes include the introduction of the Leaving Certificate Applied in September 2000 and the opening of another extension in Feburary 2001, which comprises of a new Art Room, Music Room, Chemistry Room, Drawing Room, Construction Studies Room, Library, Demonstration Room, and Guidance Suite. The latest extension of seven classrooms, a Staff Room and a Board Room was opened on the 2nd February 2007. In 2011, work commenced on a new lunchroom as well as on three new classrooms. Work finished in the latter half of 2011 and the canteen has been a huge success among students. In 2012, Mr Pat O’Leary became the new Principal. He oversaw the addition of temporary classrooms to the rear of the campus, while the DES granted the future proofing of the school, with a new building proposal in May 2018. Mr Pat Moloney took over as Principal in September 2018, with Mr Conor Cunnane and Mr Damien Scallan as Deputy Principals. Daniel Delany was born in Paddock, a small village in central Ireland, in 1747. His parents were relatively well-to-do but when his father died Mrs Elizabeth Delany agreed to have young Daniel spend the rest of his childhood with his two aunts in the nearby village of Mountrath. It was here that Daniel received his elementary education. It was here too that the parish priest, Father Denis Lawlor, influenced Daniel’s decision to enter the priesthood. Father Delany took up his duties as assistant priest in the parish of Tullow. A small village 80 kilometres (50 miles) south of Dublin. His work with the people of Tullow made him realise that the cause of much of the evil of the day was the lack of education among the people. Determined that the Irish Catholics deserved better, he started Sunday schools for the children of his parish. In these classes, Father Delaney taught the children Catholic doctrine. After organising many public religious functions which were still illegal under British law. 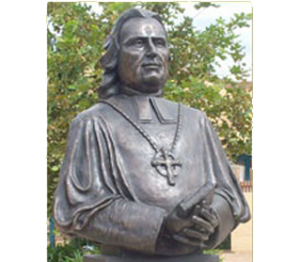 Bishop Delany finally took steps to secure for his Sunday schools a reliable source of catechists: he founded two religious congregations. On February 1st, 1807, he received the first women to start the Sisters of Saint Brigid (Brigidines). A year later on February 2nd, he received four men to start the Brother of Saint Patrick (Patricians). In 1868 when the Papal States were invaded a group of Irish volunteers went to defend the town of Pio Nono, but sheer force of number told and the town fell. One of these volunteers, John Howlin of Wexford, who had experienced the Pio Nono battlefield and a French prison camp, heard of the Patrician Brothers when he returned to Ireland. He needed no coaxing to enrol under their flag of Saint Patrick. When he entered the congregation he took the name Aloysius.In February of 1883 Brother Aloysius was in Rome on behalf of the Brothers working towards gaining recognition of the Brothers as a Religious Congregation. He was able to obtain a private audience with Pope Leo XIII who had been the Archbishop of Perugia under whom Aloysius had served as an Irish volunteer. During this audience Aloysius asked the Pope if the Brothers could have permission to wear a green sash as a part of their religious habit in honour of Saint Patrick. Pope Leo granted the petition. It wasn’t until more than five years later on the 15th August, 1888, that the Brothers wore the sash for the very first time. This distinctive badge of the Patrician Brothers is thus a souvenir, perhaps the only permanent one, of the gallant Irish swords taken up in defence of the Pope’s temporal power.